BU researchers are part of the ECOSAL team investigating, recording and enhancing the setting of traditional salt producing sites around the Atlantic coasts of Portugal, Spain, France and the UK. The research project is primarily concerned with the traditional production of salt, as well as the archaeology & heritage, the ecology and the biodiversity of locations and sites associated with salt production. One of the main aims of the research is to create a heritage trail entitled, ‘Traditional Saltmaking – Atlantic Route’, in order to tell the story of Atlantic coast salt production through the ages and to interpret and enhance a selection of sites for visitors. ECOSAL stands for ‘Eco-tourism in saltworks of the Atlantic: a strategy for integral and sustainable development’ and is an INTERREG IVB (Atlantic Area Trans-national Programme) research project. The main objective of the ECOSAL Atlantis project is the development of joint, integral and sustainable tourism based on the cultural and natural heritage of traditional Atlantic salt-working sites. To promote the conservation and understanding of Atlantic salt-working sites by circulating information and creating trans-national synergies. Read more online about the history of salt making in the UK or the salt making process. 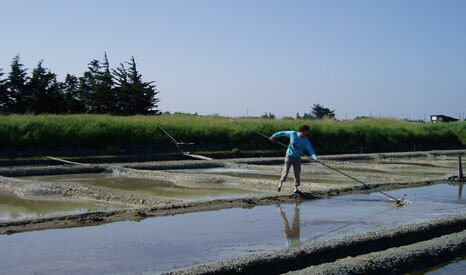 The ECOSAL Atlantis project is international, running in four European countries: Portugal, France, Spain and the United Kingdom. To reach our project in the United Kingdom, email Professor Mark Brisbane or Dr Roger Herbert or contact by post: ECOSAL Atlantis UK Co-ordinator, Bournemouth University, School of Applied Sciences, Poole, Dorset, BH12 5BB. To reach the international project, please visit the international ECOSAL Atlantis website. BU’s School of Applied Sciences, including Professor Mark Brisbane and Dr Roger Herbert.